Jemima, the wonderful lady behind Pedigree Dogs Exposed isn't just a TV director. She's a dog lover who occasionally can't help herself and takes in yet another dog that needs a home... few people realise she does rescue in her spare time. Here is the story of the gorgeous Dexter, can you see if you know someone who likes their dogs big who might have a space? His need is quite acute - he's staying at a local pub at the moment but it's temporary - although the customers are loving his company! 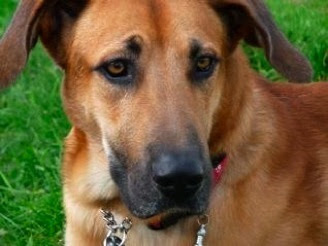 DEXTER.. is a gorgeous great dane/GSD x , we think about two years old, who has a great many strengths. He is very soft, very affectionate and bonds easily. 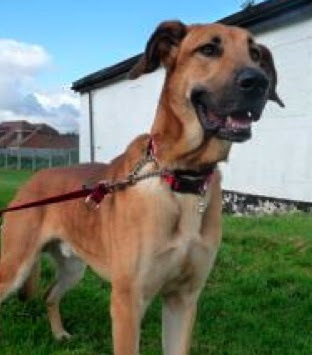 He is also very obedient, house-trained, chilled out indoors, very good on a lead and terrific with children and cats. But Dexter is a sensitive soul and has had a tough time of it in recent weeks. His situation is now urgent and we are in desperate need of an experienced foster/permanent home for him. Dexter’s owner gave him up on the grounds that he had bad recall if you walked him off-lead through a field of sheep (a test for most dogs, surely...?). Dexter landed in an Irish rescue where he got stuck - overlooked because he is simply too big for most people, and not dane-like enough to be of interest to the purebred fans. Dexter ended up in a stable for 23 hours out of 24... safe enough but desperately unhappy. He lost more and more weight until, four weeks ago, we had a call from our favourite rescue angel in Ireland (Ann Moore, who helps the dogs of Dundalk) asking if we could help. She feared that Dexter would die if he couldn’t be found a home situation as soon as possible. So Dexter arrived three weeks ago and we found a foster home for him in Dorset where he has been fantastic - except for one problem. Foster mum Toni has not felt confident enough to let him off the lead yet and Dexter has now started reacting quite strongly when he sees some other dogs. It’s not aggression but he barks and tries to turn himself out - unnerving when you’re as small as Toni. And of course, you can’t just let large dog like him loose to hurl himself towards other dogs, however friendly the intention. Toni is finding it very hard to cope and so we now need to move him urgently. Poor Toni, feels terrible she can;t do more for him - and not least because she loves this fella to bits - but she says she is now making Dexter more anxious. He also, of course, has a lot of pent-up energy because he has not been able to have a good run. If you are interested in Dexter, either as a foster or a forever home, please email info@blackretrieverx.co.uk asap. There will be an adoption fee of £125 for Dexter, which includes the £65 it costs to transport him from Ireland.